CodeWeavers is always excited to see new platforms where we can expand Windows compatibility. 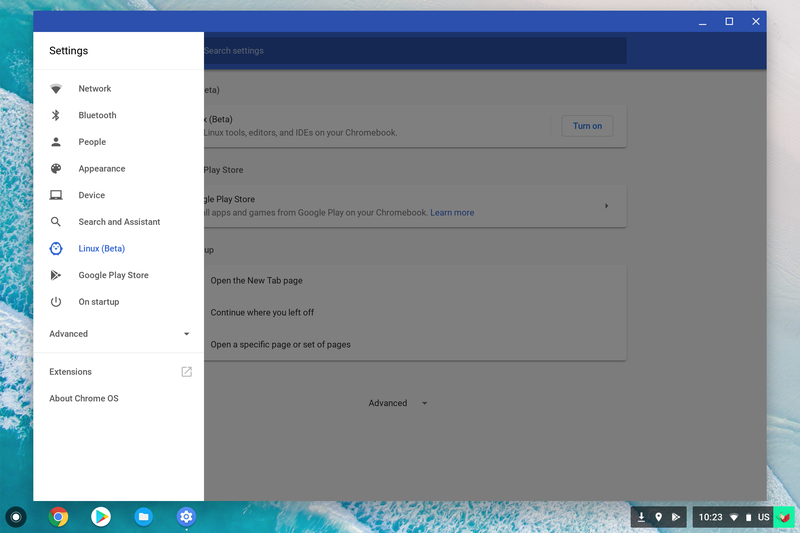 Of course we were thrilled when this year at Google I/O, the Chrome OS team announced a powerful new feature coming to Chromebooks. Starting with Google Pixelbook, Chrome OS will be able to run a full Linux environment in a secure virtual machine. Linux VMs on Chrome OS open up a lot of possibilities. Google focused on the ability to use Chrome OS as a self-hosting Android development platform by running Android Studio in the Linux VM. At CodeWeavers, of course, I was excited to try running our Linux build of CrossOver on a Chromebook inside the virtual machine. A clarification: running CrossOver for Linux on a Chromebook is early and experimental. 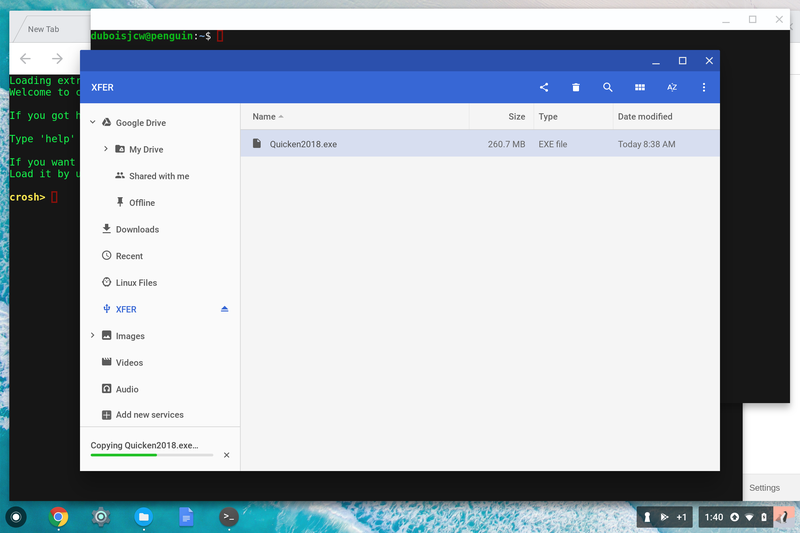 Across the board, Linux containers on Chromebooks are still a developer focused feature. Also, CodeWeavers has a version of CrossOver already available in Google Play. 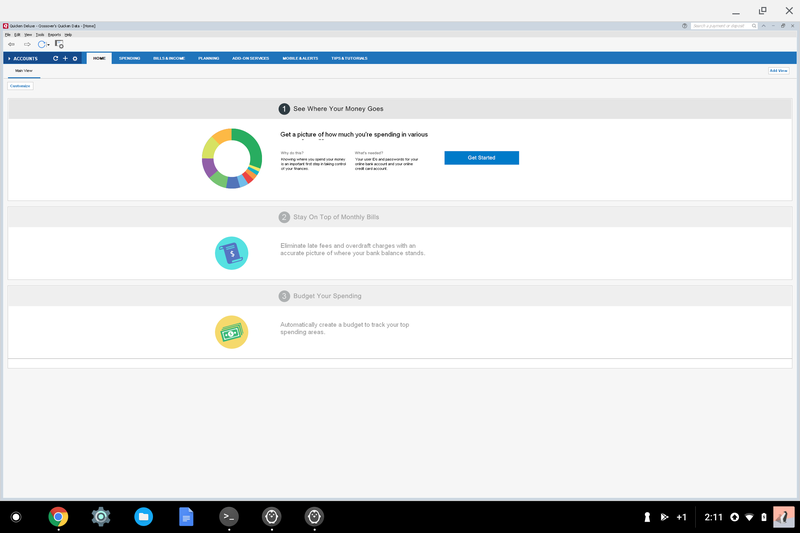 That product - running via the Android system - is our more mature offering on Chrome OS and remains our current go-to means of running CrossOver on a Chromebook. With that said, it will be an interesting journey to try using these new Linux VMs to run Debian CrossOver on Chrome OS. Let's get started. The Linux VM is currently only available on a Google Pixelbook. 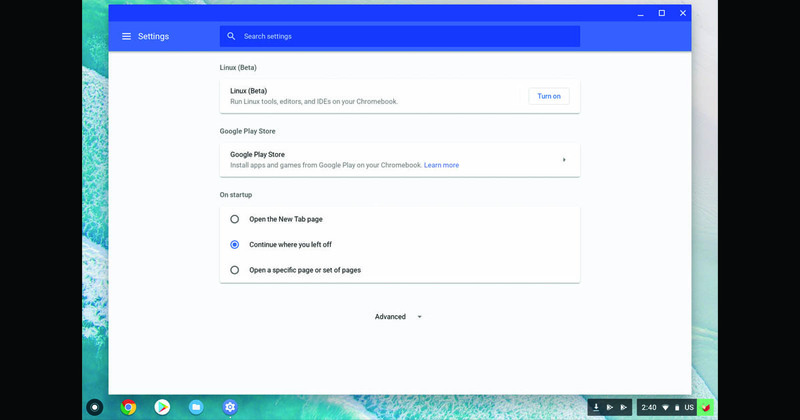 Once that is done, you can navigate to the Chrome OS Settings and see a new "Linux (Beta)" option. Select that, and click 'Turn on'. 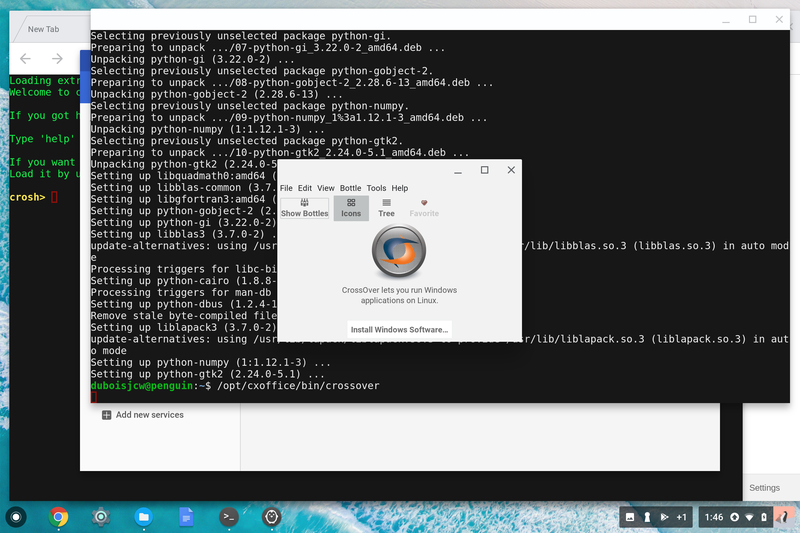 This will download and install some things, and after a minute or two you will get a new window with a bash shell running inside a Debian Linux instance. fixes that, and we can do the wget command again to get a crossover.deb. Now we should have a working install of CrossOver. Now let's try to install Quicken. The first problem is that I have a Quicken.exe installer on a USB flash drive. The Linux VM does not have access to my USB drive nor the outside filesystem. I need to put a copy of that into the Debian container so that CrossOver can make use of it. To do that, I insert my USB key and open the Chrome OS files app. Now that my Linux VM is running, I see an entry in the Files app called "Linux Files." I can easily drag the Quicken.exe file from my USB drive in there. from my terminal shows that it has appeared in my Linux VM in the root of my home directory. Simple enough. 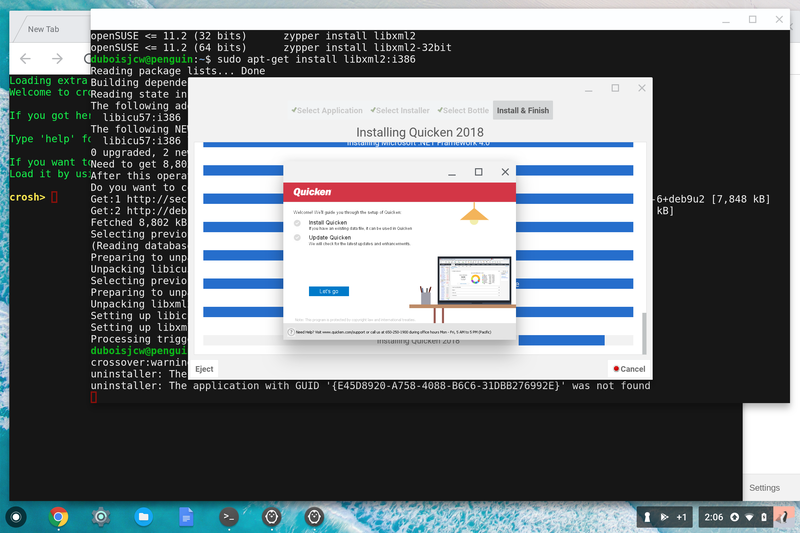 Now I click on CrossOver's 'Install Windows Software' button and search for Quicken 2018. I can select the Quicken.exe installer file I just copied into my VM and the install kicks off. ... and re-start the install. The install process goes smoothly this time - same as CrossOver on any platform. Quicken's Windows installer presents itself. I click through several 'OK' buttons, and at the end, I have a Quicken icon in CrossOver's launcher window. I click that, an Quicken starts up! There are a few bumps and warts. The biggest is that I'm not getting a CrossOver launcher in the Chrome OS launcher, and I'm not getting Quicken launchers there either.1 In theory this ought to work. Again, it's not clear whether this is a problem with CrossOver or with the Chrome OS Linux integration. Things are in the early stages, though, so a few flaws are not too surpising. We don't know yet what the future holds for Linux VMs running on Chrome OS. Increased security for running Windows applications is one likely advantage. The robust developer tools available on Linux will make it easier for us to develop CrossOver for Chromebooks via a Linux VM. Of course, smoother integration and a more seamless user experience will be paramount. Virtual Machine technology is a powerful addition to the Chrome OS lineup. CodeWeavers is very excited at the possibilities this opens for both Chromebooks and CrossOver. Josh DuBois is an engineer and product manager for CrossOver. This may be obvious, but I'm guessing this will only work with x86 Chromebooks like the Pixelbook right? I know windows is getting ARM support including x86 emulation but I'm guessing it will be a while before wine/crossover catches up. Are you stopping development on Crossover for Android on Chromebooks? I sincerely hope not. While i know it's more difficult to implement CrossOver on Android, it runs at the same level as the OS. On Linux VM it has no HW acceleration and sine it's a virtual machine it runs very slowly. Sorry for the late reply. Our Android product is still in Google Play. On the question of hardware accelerated graphics from within the VM in Crostini, the Chromium projects public bug tracker has an issue for adding this feature to the Linux VM on Chromium OS. The upshot, I think, is to watch that bug ... if you are in fact talking about access to the GPU from within the VM on Chrome OS, it looks like work is being done in that direction.